Welcome to the May 2016 Mystery Chocolate Box! This bar had an interesting flavor combination that we hadn’t tried anywhere else, so this was most likely a first for you! (it was for us). It’s made by one of our favorite international chocolate makers — you’ll see exactly who in a moment. So what exactly was this unique bar? 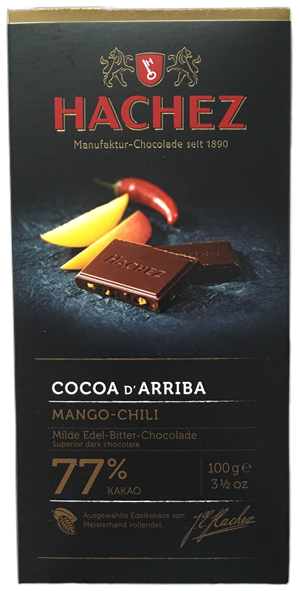 Hachez has always made some very interesting chocolate bars — the kind that we love! They’re always a welcome inclusion in our boxes, and we’re glad they introduced us to this unique flavor combination that we haven’t seen anywhere else. This bar contained one strong common flavor combination with chocolate, so we hope you got it! However, there was another flavor that wasn’t quite as strong. Very subtle, and we found it a bit hard to detect, so only the finest chocolate guessers will get all two flavors. If you didn’t guess the rosemary part, don’t feel too bad. We didn’t really taste it too much either. That said, if you did taste it, congrats! You have quite a sense of taste. Anyway, we thought this was a great mint chocolate bar. Hope you did too! This is one that we, even though we knew what it was, had no idea what to expect taste wise. But when we tried it we were blown away by how delicious it was. I knew right away that this bar needed to be included in an upcoming box. One thing we have to mention about this bar (other than it being quite tasty) — they don’t actually include gin or tonic in this bar. 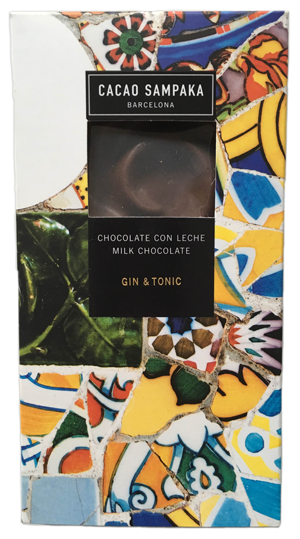 Rather, the delicious taste in this bar is created by juniper and crystallized lemon. Oh, and we loved the interesting swirl texture on the bars. Very interesting, and something we haven’t seen before. So what did you think of this box? Let us know! We’d love to hear your feedback. No Replies to "May 2016"